Caddyshack is one of the most beloved sports movies in American history. Nearly 35 years later, it's impossible to step onto a golf course without someone quoting the film. The film has garnered a large cult following and has been hailed by many publications, such as Time and ESPN, as one of the funniest sports movies of all time. 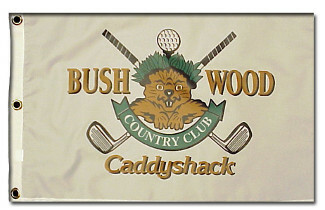 This is a Replica Screen Printed (not embroidered) CaddyShack Gopher Logo Bushwood County Club 12X21 Golf Flag.